The longer grapes hang on the vines, the more apt they are to have a run in with birds or other ills. 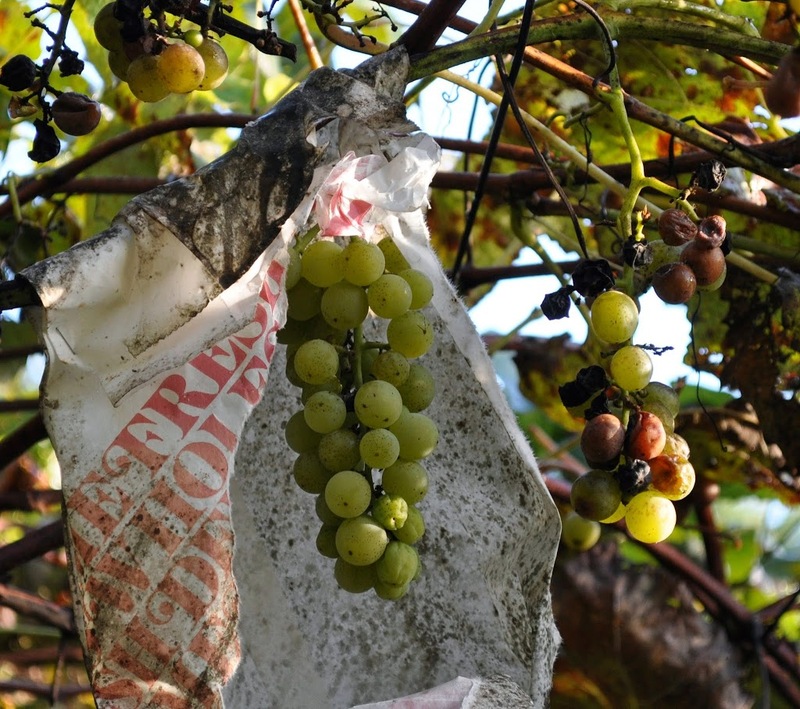 Bagged grapes, on the other hand, can be left hanging until they are dead, dead ripe, at their flavorful best. How about flowers? I seem to have been ignoring them. In fact, the longer I garden, the more I look upon flowers in the same way as icing on a cake. They are a nice addition, but they are not the main show. Center stage around here is given to stone walls, arbors, trellises, fencing, the bark and tracery of branches of trees, and leaf shapes, colors, and textures. Their statements are bolder, less frivolous, and endure throughout the year . Still, every year I do try out a few new flowers, and three annuals brought both beauty and endurance (for a flower) here this summer. All three have been blooming nonstop since late spring, and should keep up the show until weather turns frosty. number of pastel colors, just like traditional petunias. 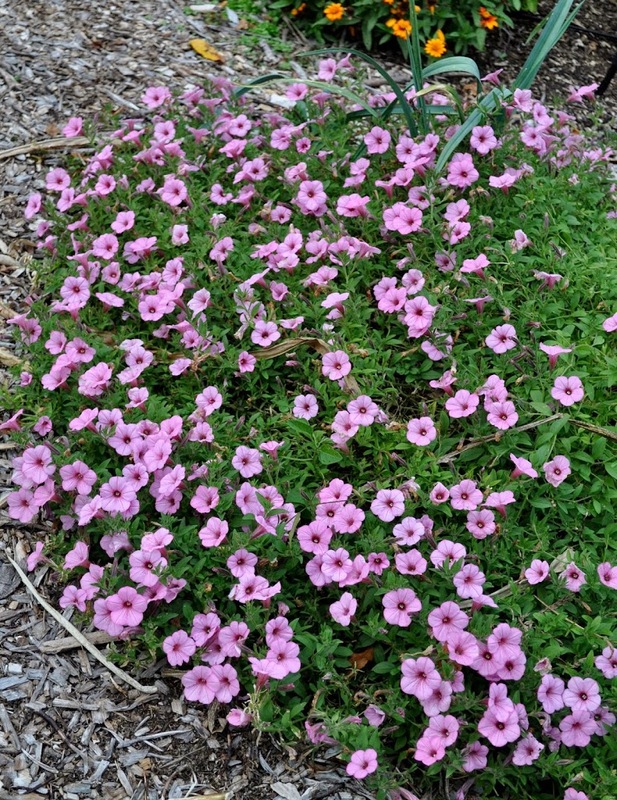 They part ways with traditional petunias in their profusion of nonstop blossom. The blossoms always have an attractive backdrop because they are self cleaning — spent blossoms disappear into nothingness. The second floral winner for the season is Xerochrysum bracteatum, sometimes classified as a Bracteantha species and sometimes called golden everlasting, or strawflower. 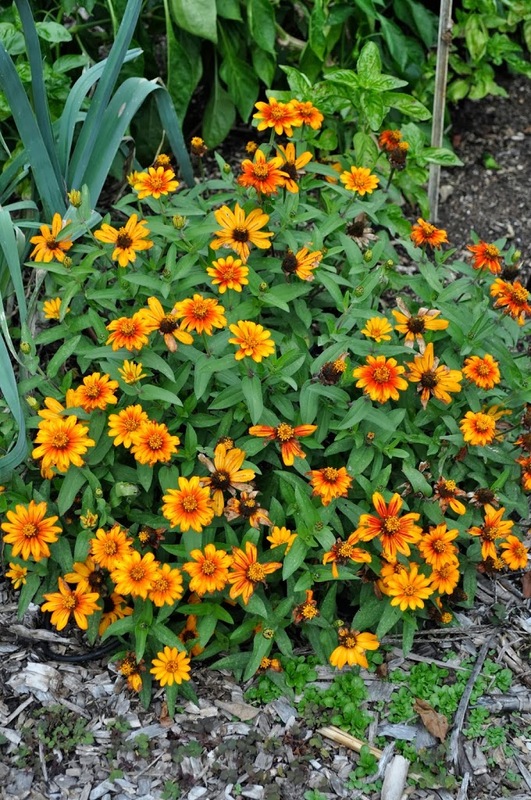 I am growing the hybrid called Sundaze Blaze. Bracteantha is, in fact, closely related to, and resembles, the more familiar strawflower (Helichrysum), looking like one that’s spreads its wings (petals, in this case) wider and larger. This native of Australia grows in just about all habitats there, except those that are shaded, so, as you might imagine, it’s a tough plant. offered some protection to my grape bunches that were not bagged. And finally, there’s Begonia benariensis, the variety Surefire Rose. I’m not a big fan of begonias, except for the Mandarin series, with their elongated, lance-shaped flowers and leaves all drooping decoratively from their pots. Surefire Rose, in contrast, is rounded: the leaves are rounded, the flowers are rounded, and the overall shape of the plant is rounded. With little enthusiasm, I plopped a few small plants I had been sent to try out into holes I made beneath a witchhazel shrub on the north side of my house. Sometime around midsummer a critical mass of blossoms was reached. The red color of these flowers spilling out from beneath the witchhazel and onto the wall containing that bed would stop me in my track as I walked by. The show has increased in the intervening weeks. As good as the show was from these annuals, they are, after all, annuals, destined to collapse in death with the first hard frost. 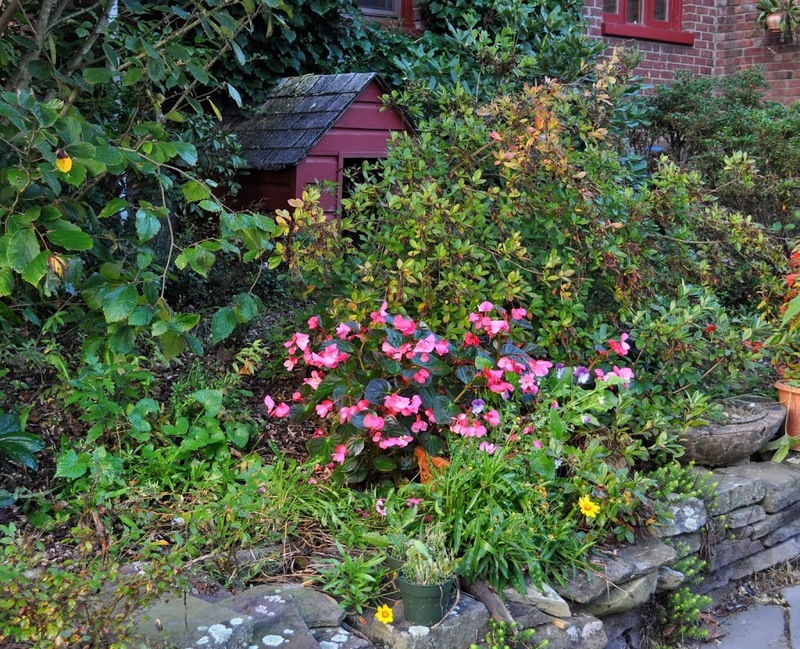 The begonias are tender perennials, so could be carried through the winter indoors if I dug up the plants and potted them up, or rooted cuttings. Easiest to preserve, literally, would be the bracteantha; like strawflowers, bracteantha dries well. I’ll give it a try. Observation and note-taking are crucial to good gardening. Some gardeners have the observation part down, fewer write them down. Observations are pretty much useless once forgotten or mixed up. •Sow parsley on July 7th for transplanting into the greenhouse on September 17th. •Sow kale and Swiss chard in the greenhouse for transplanting in the greenhouse on September 17th. This entry was posted in Uncategorized and tagged bagging, begonia, bracteantha, grapes, sowing dates, supertunias. Bookmark the permalink. Trackbacks are closed, but you can post a comment. Hi Lee, okay to use plastic shopping bags instead of paper ones? No. The fruit needs to “breathe” and release water vapor. Okay, will brown paper lunch bags work? Concerns about rain weakening them, though. Brown paper lunch bags would work but, as you said, could weaken in rain. I bought a box of deli bags to last me many years. Lee, could you link to a product on Amazon or elsewhere? Still not quite sure exactly what you have in mind or where to find them.